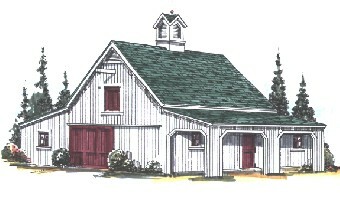 This pole-barn has a shady10'x24' shelter for your outdoor grooming area, run-in or equipment shed. It can be built with two or four stalls. There's a 20'x24' open center area for storage and grooming and a 16'x24' Loft. 2-Stall Barn Floor Area: 720 Sq. Ft., 4-Stall Floor Area: 920 Sq. Ft., Shelter Area: 240 Sq. Ft., Loft Area: 420 Sq. Ft., Ridge Height: 20'-4"